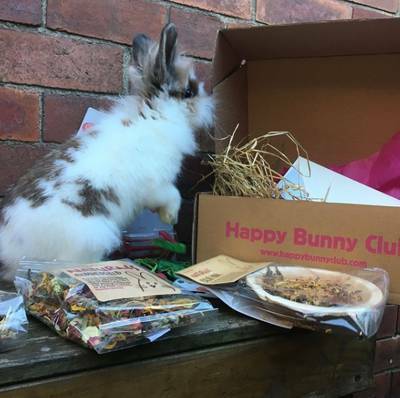 Enter your email address below to receive a notification when Happy Bunny Club starts accepting new sign-ups! 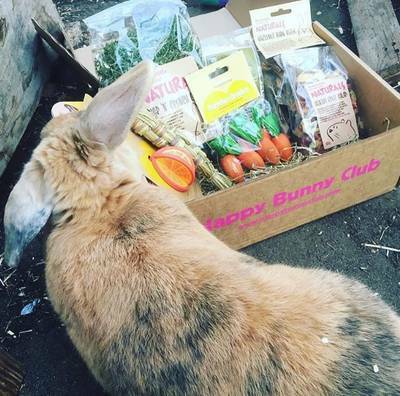 Enter your email address below to receive a notification when Happy Bunny Club is accepting new sign-ups again. We ship on the 21st of each month. 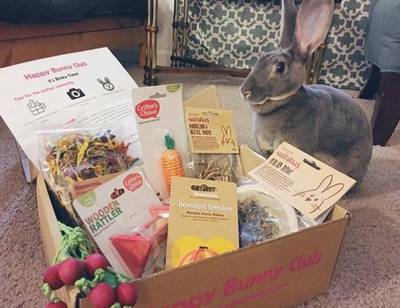 Happy Bunny Club: A subscription box for bunnies! 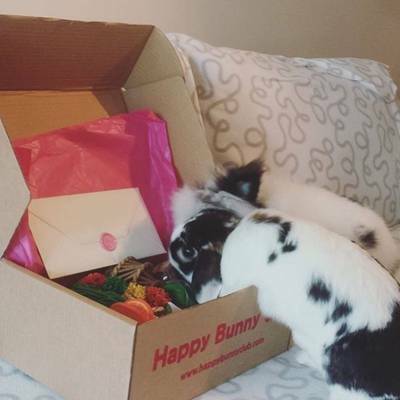 Happy Bunny Club is the monthly subscription box for bunnies. 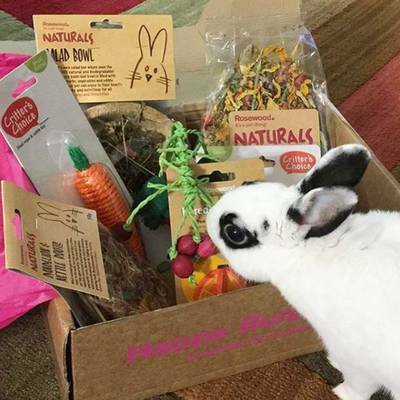 Every box has at least 2 fun toys, 2 bags of all natural treats and 1 or 2 surprise items. We lovingly pack these inside a yummy cardboard box, with non toxic paint. We also include a hand sealed letter, listing all ingredients and our charity of the month. All products guaranteed safe! No corn, dairy, egg or seed ingredients in any of our products. A hand signed and sealed letter from the team detailing our charity of the month, care tips and our latest news. 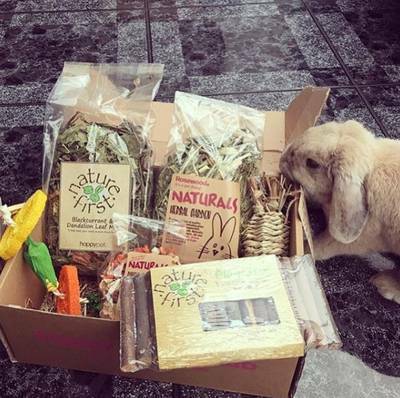 A list of all ingredients in this months box (we know some bunnies don't like certain ingredients). All lovingly packed together with hay, in a cardboard box that uses non toxic paint for our branding (so yes, your bunny can play with this too). 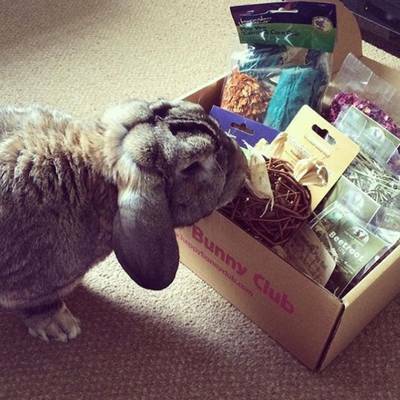 Very happy bun, he loved everything in his box, including the fresh hay in the bottom of the box! 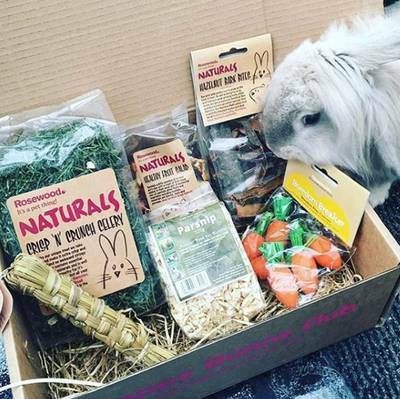 My bunny doesn't always like the things in the boxes and she was actually allergic to one of the products which concerned me greatly. I ended up throwing away a good portion of the products because she just wasn't interested in them or allergic to them. However, they really do pack the box full of products which is nice. I'll try it a few more months to see if there's any improvements for my little Ellie. UK to USA Shipping Time & Cost WORTH IT! Yes, if you live in the States, the Happy Bunny Club boxes cost a bit more in shipping than for GB customers and for EU customers. No, if you live in the States, you won't get your box immediately after the monthly ship-out date (the 21st of each month), like GB customers do, and nor will you receive it as quickly as EU customers do. YES, Happy Bunny Club is WORTH IT! 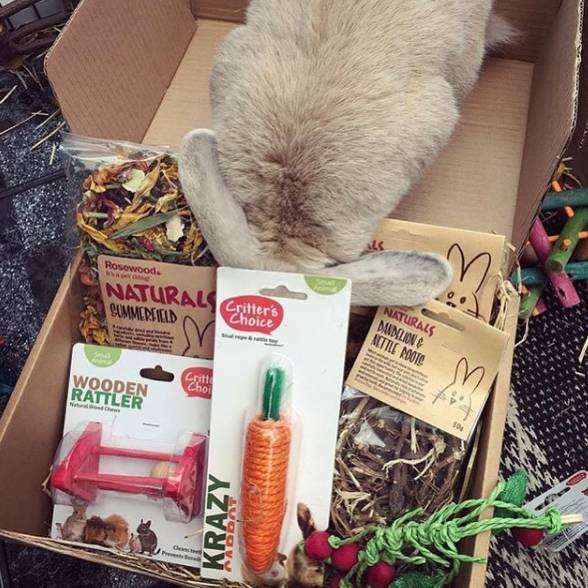 US customers are able to receive UK-brand, trusted, quality, house rabbit products, which are otherwise rather difficult to find in the USA. 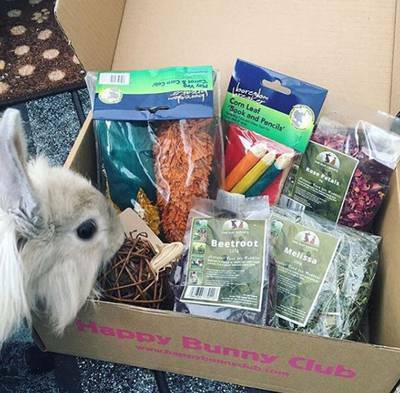 Those products which may be found elsewhere, AND deliverable to USA addresses, often cost much more than what the same products cost, delivered by Happy Bunny Club's surprise monthly boxes.